With most central banks shifting to a more downbeat bias, I’m thinking the RBA could also take a dovish tone in their next policy statement. 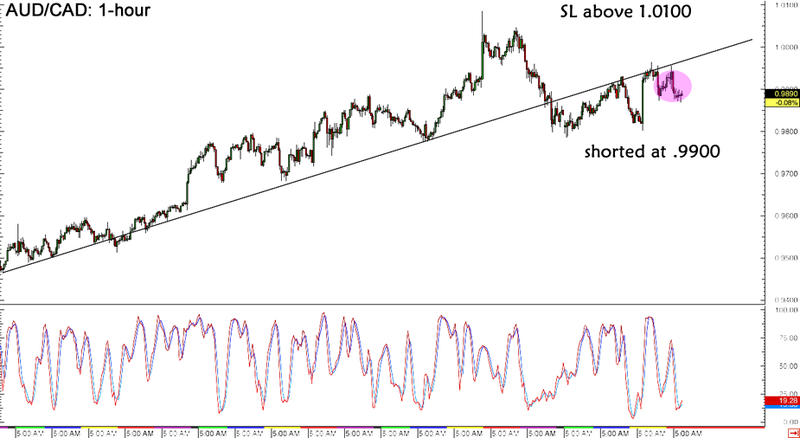 That’s why I’ve decided to take this short AUD/CAD forex trade! Before reading on, make sure you look at my multiple time frame analysis on my initial AUD/CAD trade idea first. As mentioned, I’ve decided to take a short entry with half my usual position size at the .9900 mark, as the broken trend line appears to be holding as resistance. I’ve set a wide stop above the previous spike to 1.0100 and I’m planning on adding another half position if price tests resistance at parity once more. Since I’ll be holding on to this as a swing trade, I’m aiming for the previous lows at .9400 as my profit target. As for fundamentals, I’m thinking that the downturn in inflationary pressures might also lead the RBA to leave the door open for a rate cut. This could draw traders back to the Loonie, which might enjoy a bit of support from the improving U.S. economy and a potential rebound in oil prices. Do you think this one will work out?